Optional upgrades includes Top Down//Bottom Up and Motorised Systems. 100% pure natural silk blinds. - If you are on of those who like a soft and colorful looking window treatment, then a Roman shade or Roman blinds could be just the thing for you. - Such blinds go about their function efficiently and also unobtrusively add color and drama to any room. Based on the skills of our adept professionals and skilled workers, we are presenting a commendable range of Roman Blinds. Our offered roman blind is tested on numerous parameters of quality for dispatching a defect free range. The offered roman blind is used to decorate windows in homes, hotels, offices and other segments. Keeping in mind the diverse requirements of the clients, we are engaged in offering a quality range of Woven Wooden Blinds all over the country. These blinds are available in trendy looks and designs according to the clients’ needs and demands. Moreover, Woven Wooden Blinds are termite resistant. The curtains have been created to coordinate with our other creations, the table and bed story, in checks and stripes, printing and surface ornament techniques like embroidery, applique, aari are used to make curtains stand out from the ordinary. The fabrics generally used are cotton, voile, organza, organdy, art silk, net. With enriched industrial experience, we have been able to offer a wide range of Roman Blinds. These roman blinds are designed using top quality material & modern techniques in compliance with the set norms. 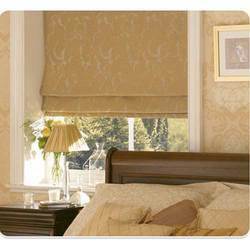 Our quality range of Roman Blinds is widely demanded owing to their elegant appearance and trendy looks. These are also available with beaded ball chain operation eliminating visible cords when stacked up and can be crafted with clients own fabric. Expectations Imp. & Exp. Pvt. Ltd.
Roman shades allow you to easily coordinate your window treatments with dozens of fabric option. The long lasting operating system lifts effortlessly and locks automatically. 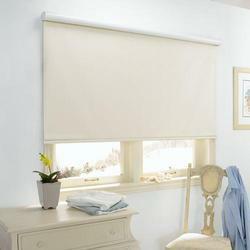 These elegant drape style blinds are dramatic addition to any window, in manual and motorized remote control mechanism.